Catching up after a long absence away from something has never been a strength. The chaos of the way that work piles up and some gets through and some gets backed up and the dam’s release when it all gives way is perhaps overstating it, but that is the general feel I have for these things. In the wake of the most recent leave from tending to my web garden and rides, the Evanston tour got cancelled. Again. The Tour of Evanston might be the tour I have the most trepidation about, though I feel most excited to do that one. The number of things that WON’T be on the tour could make an amazing tour. I think it will be a really awesome tour when it finally runs. Unless its cursed. It is starting to seem a little snake-bit with both the first and second dates cancelled with short-notice. Well, third time is so consistently the charm that I am planning on a September make-up date, nearly a year after the original tour was supposed to have run. This will be AFTER the Tour of Belmont-Cragin and Hermosa, which will go forward as planned on August 30, 2014. So yeah, the new new tour will be before the old new tour. Ross Felten’s new tour poster is spot on and posted just above. Tour information is right hear. 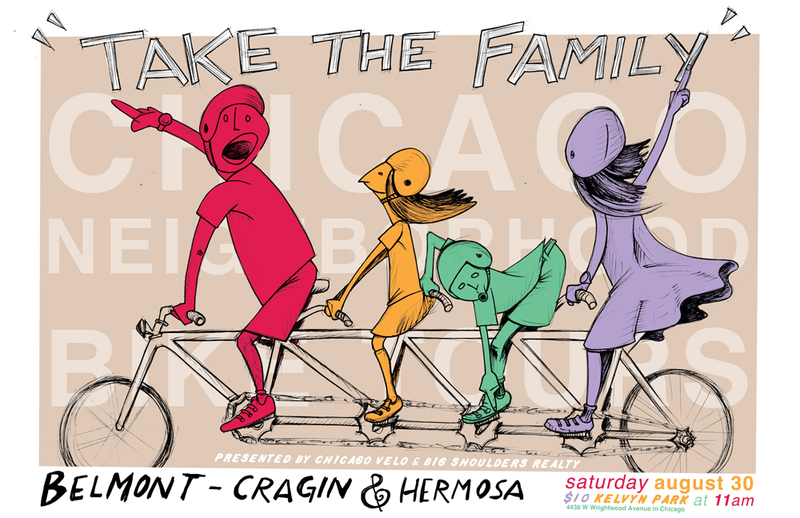 This entry was posted in Chicago Velo Blog and tagged Belmont-Cragin, Hermosa, Tour Poster on June 10, 2014 by Lee Diamond.